Some quick notes on the NatCen report: Survey of Smoking, Drinking and Drug Use among Young People in England – see Summary and Full report PDF. 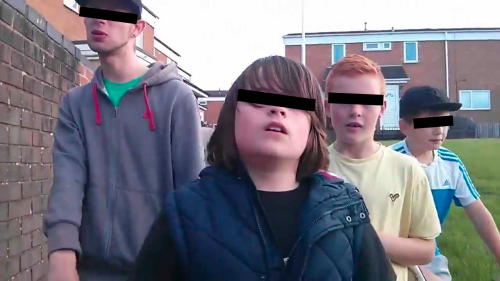 NatCen is contracted by the official statistician to conduct this survey, which provides data for 2014 for England on substance-using behaviours of 11-15-year-olds. It’s is possible that alarmist conclusions will be spun from a lazy reading of some findings on e-cigarette use. 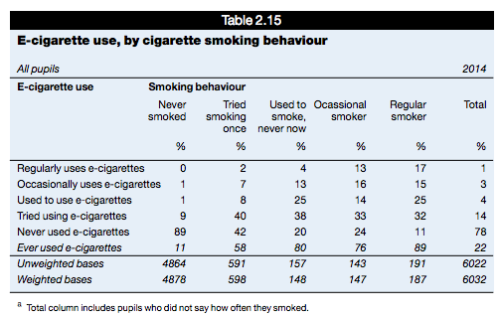 In fact, the survey provides a reassuring picture of young people’s smoking and vaping habits. NatCen chose to go to social media with a graphic that I assume it thought was the most controversial finding. Ever use for e-cigarettes is now higher (22%) than for cigarettes (18%) in 11-15-year-old school students. Ever-use (i.e. as little as one single puff just messing around) is a very poor way of characterising a substance-using behaviour. This is because ‘use’ can mean very different things ranging from intensive daily use to trying it once and never doing it again. There isn’t much reason to aggregate these very different behaviours into one measure. However, there are much more interesting findings than this in the report… and without exception they provide the message: no need for a moral panic, it’s all going rather well. As we will see below, regular (at least one per week) e-cigarette use is low (1%), about one-third of regular smoking (3%) and highly concentrated in smokers or those likely to smoke. The 22% ever-use figure for e-cigarettes sounds like a lot. In reality, there’s hardly any vaping in this age group. See section 2.6.2 on p27 (emphasis added). More than one in five pupils (22%) reported that they had used e-cigarettes at least once. There was little evidence of frequent use of e-cigarettes. 14% of pupils reported that they had only tried them once or twice, 4% said they used to use them but didn’t now, 3% reported occasional use and just 1% said that they use e-cigarettes regularly, once a week or more. Which illustrates the folly of making a graphic of 18% vs 22% and pushing it around social media. But let’s not be churlish – this news is good. The familiar story that e-cigarette use is concentrated among young smokers also leaps from the data. In fact, table 2.15 shows zero percent of regular e-cigarette users had not smoked previously. 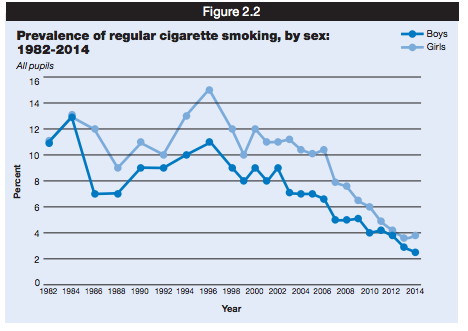 The story on youth smoking remains very positive, with prevalence at record low levels in this age group – and driven down by many factors, but not obviously driven back up by vaping, ‘renormalisation’, gateway effects or similar. Again, the data show how important it is to characterise the behaviour by the frequency of use, and not to rely on ‘ever use’. Ever-use is little more than an indicator of propensity to experiment, though it is interesting to note its steep decline over time – not necessarily a sign that young adolescents have become more risk-averse, but possibly more risk-diverse. In 2014, 18% of pupils reported that they had tried smoking at least once. This is the lowest level recorded and continues a steady decline over time from 1996, when 49% of pupils had smoked at least once. Despite the headline 18% figure for smoking, regular (weekly) smoking in this age-group remains at 3%, a record low. Pupils who reported smoking at least one cigarette per week were defined as regular smokers. In 2014, 3% of pupils were classified as regular smokers, at the same level as in 2013. This proportion has declined over time since 2001, when 10% of pupils were regular smokers, and mirrors the decline in the proportion of pupils who have ever smoked. Despite the comparison of ever-use of cigarettes (18%) to e-cigarettes (22%), regular cigarette use (3%) is three times higher than regular e-cigarette use (1%). I am not saying this is a good thing – frankly I would rather it was the other way around. Some caution is needed when looking at this data in isolation as it cuts off at age-15. If young people were starting to smoke later it would mean a decline in this age group, but not necessarily a decline in the total number of regular smokers emerging into adult life. These data show that vaping is basically not causing problems among young people. To the extent that e-cigarettes are used by young people, the vast majority of use is by smokers or people with a pre-disposition to smoke. ‘Protecting the children’ is often used as a trump card argument to impose restrictions on adult choice and commercial freedoms, and is used to underpin baseless assertions that companies are marketing to children. We should not allow adult society to be bent out of shape by tactical arguments about children that have no basis in reality. This is important for adult health, because it suggests we have a relatively free hand in encouraging and facilitating adult smokers to switch, without worrying too much that young people who wouldn’t otherwise have smoked will take up vaping or young people who would otherwise have never smoked in the absence of e-cigarettes transit from vaping to smoking. It is often asserted that ‘harm reduction’ is a balancing act: between the health of adult smokers, and risks of increasing new nicotine users or smokers. These data provide support for a determined public health focus on helping willing adults switch from smoking to vaping. How many kids have EVER tried alcohol under the age of 18? In my youth, I believe EVERYONE had tippled, in fact probably every one I knew back then had been drunk at least once. Yet supermarket aisles are riddled with ‘gummy bear’ (etc) alcohols. Do we see campaigns to ban alcohol as vehemently as we do e-cigs? NOPE! Well put Clive. The ever-used statistic is depressingly easy to misuse and make click-bait headlines, whilst the underlying good news is easy to hide. Thanks, Clive–this is really helpful. I am too lazy/dense to have found it yet in the full report, but do they reveal past-30-day smoking and vaping? I’m seeking to have a clearer sense of a comparison to the US data (which typically hinges on past-30-day use). No, the data is (sadly) not compatible with US NYTS both because the age range is different and the frequency of use classification and probably the way the questions are asked: we don’t suggest to adolescents that e-cigarettes are tobacco products. And the divisions are (mainly) more informative. Daily use seems like a bit of an omission, but it certainly beats classifying current use as within 30days!